CRIMSON IN THE VERY WRONG FAIRY TALE coming soon! Liz Jasper here again. 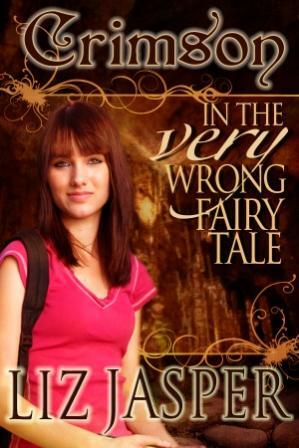 Crimson in the Very Wrong Fairy Tale is a YA (Young Adult) book. That basically means it’s written for teens but adults ignore that and read it anyways. At least that’s what I do. Crimson in the Very Wrong Fairy Tale is the first in a three book series. It will be available in trade paperback and as an ebook. And, yes, I’m back to writing the Underdead books now. 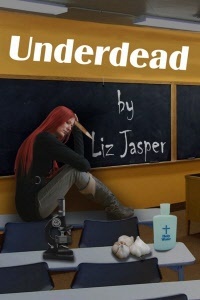 The Underdead series will have at least two more books. And as a special note for Father’s Day, thank you Dad for supporting my writing in your own, special Liz’s Dad way–by giving me all the reference books you can get your sticky fingers on and then telling everyone you know to buy everything I publish. You Rock. Special dinner tonight for you! 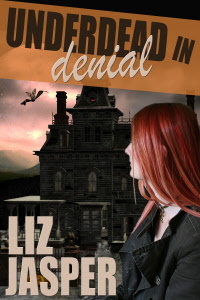 This entry was posted in Book news, Uncategorized and tagged Crimson in the VERY Wrong Fairy Tale, Demons, fantasy, humor, liz jasper, paranormal, underdead, YA, young adult book. Bookmark the permalink. Woot Woot!!! A new book and the added excellent news that there will be at least two more Underdead books! Can it get any better? Jude–you totally made my day! Thanks for all that!! Now, I know it comes as NO surprise and over-the-top excited I am about this. I ADORE this book. Yes, people, I was lucky to read an early version and I’ve been waiting for you all to have the chance to fall in love with Crimson! Be ready to love her. She ROCKS!!!!! Thanks Ging! I swear I can hear your shout from here. :))) I have one more (loaded) (happily) word for you: ninja! Is there no escape from school? Mike, that’s just…perfect. I am cracking up and bowing to your greatness! I’m going to steal that. Do you mind? I’m totally going to have to do a back cover copy in haiku now. It just needs to be done! Thanks for writing! This made my day. Get your kindle fixed–you must be able to read books! Happy New Year! Thanks, and Happy New Years to you too! I absolutely can not wait to get my hands on any other books you write.